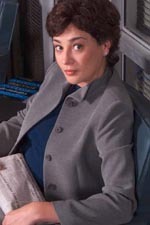 The actress, Moira Kelly, has left the show. We have no idea what excuse Sorkin will give for Mandy leaving --- if he ever mentions her --- but there were times during the first season episodes when Mandy expressed interest in working for other clients while keeping her job with the White House and when she was told, she wouldn't be able to do that, she may have decided to go on to other things (esp. after the flap about her memo and how she was cut out of things for awhile after that). Sorkin did say that he wants to mention why Mandy left but that has not come out so far. "I have some news," Mandy tells her assistant, Daisy. "Well, there's a way to see it as bad news, but I think it's good news." "Lloyd Russell is no longer our client." "Lloyd Russell is our only client." "What happened? This is a total disaster!"